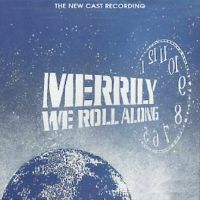 Leicester Haymarket Theatre Cast, 1993 (JAY, 2CDs) (4 / 5) This is a recording of a heavily revised version of Merrily We Roll Along, with substantial dialogue sequences included. The story line is still plagued by a breathless view of showbiz mores, and the idea that writing Broadway musicals is a career for noble souls while working on Hollywood films is iniquitous. New material includes “That Frank,” a reworking of “Rich and Happy”; “Growing Up,” sung by Frank and his second wife, Gussie; and the entr’acte, bows, and exit music. Also included is a song that was cut from the original production: “The Blob,” Gussie’s disenchanted description of the guests at her New York party. This lively, up-tempo performance has strong work from its mostly British cast, especially Michael Cantwell as Frank and Jacqueline Dankworth as Beth, Frank’s first wife. Maria Friedman strains for brittle sophistication as Mary, but she partners nicely with Dankworth and Cantwell in “Not a Day Goes By.” American performer Evan Pappas is a very capable Charley, especially in “Good Thing Going.” Louise Gold is an aptly cynical Gussie. Minor flaws include some shaky American accents and occasionally over-emphatic performances, but it’s interesting to hear the score performed by an adult cast. — D.B. 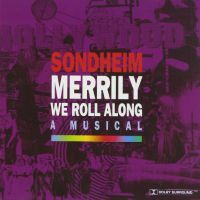 Off-Broadway Cast, 1994 (Varèse Sarabande) (4 / 5) The York Theatre production of Merrily We Roll Along is preserved on this recording, which presents a slightly condensed version of the material heard on the Leicester Haymarket album and has a slight edge over that version because it boasts superb singing and warmer performances overall. Malcolm Gets and Adam Heller are in fine form as Frank and Charley. Amy Ryder is quite wonderful as tough-talking, heartbroken Mary. Michele Pawk is a gutsy Gussie (her brassy rendition of “Good Thing Going” is a riot), and Anne Bobby is the most touching Beth on record, especially in “Not a Day Goes By.” Jonathan Tunick’s new orchestrations, for far fewer instruments than the Broadway production boasted, work quite well, giving the entire performance energy and bite. 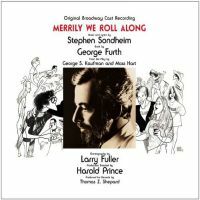 A particular standout is “Opening Doors,” one of Sondheim’s most dazzling numbers, in an extended sequence that shows us Frank, Charley, and Mary at the beginning of their careers. — D.B. New York City Center Encores! Cast, 2012 (PS Classics) (2 / 5) The much-anticipated Encores! 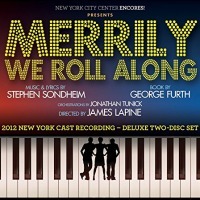 concert staging of Merrily We Roll Along proved to be oddly listless, and so is this recording. The casting is partly to blame. Colin Donnell’s Frank is so bland and forgettable that at times he seems to disappear from the show. Lin-Manuel Miranda is strictly pro-forma as Charley, lacking the fury (and the vocal ability) that Lonny Price brought to the role. Celia Keenan-Bolger struggles to effectively deliver Mary’s acid-laced wisecracks — e.g., PARTY GUEST: “I wrote the screenplay for Frank’s movie.” MARY: “Your secret is safe with me.” Also, during the reprise of “Not a Day Goes By,” one misses the effortless heartbreak that Ann Morrison brought to the number. Thanks to slower tempi and a general lack of urgency, one begins to notice that the song “That Frank” is inferior to the one it replaced, “Rich and Happy,” and that “Growing Up” and “The Blob” are among the weaker numbers in Sondheim’s songbook. Adam Grupper and Elizabeth Stanley are fine as Joe and Gussie, with Betsy Wolfe the standout as Beth. Completists will want this recording, especially given the personnel involved, but any of its predecessors makes a better case for this famously troubled, heartbreaking show. — D.B.